Annual TB Research Conference and World TB Day Celebration held in Dire Dawa and Haramaya, Eastern Ethiopia. As we got into a 100 plus years old train early in the morning, we were wondering how we were able to get such an outstanding technology back in the 1960s. I believe this was what the organizers of the 11th TRAC conference aspired while planning the first day event which commenced with a train ride from the old train station to the city’s Millennium Park. 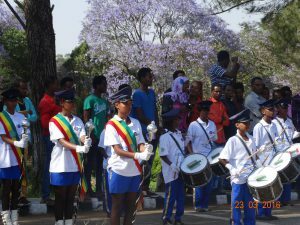 A feeling of pride in past achievements and strong desire to bring about even more marvelous successes was flowing in the air in the bright and sunny morning in Dire Dawa on 21 March 2016. Over 400 Senior and junior researchers, representatives from governmental, partner organizations, academic institution and the media all gathered together to highlight and showcase Ethiopia’s achievements in TB and health research as well as to commemorate the World TB day on March 24 the date when Dr. Robert Koch announced his discovery of Mycobacterium tuberculosis, the bacillus that causes tuberculosis (TB) in 1882. 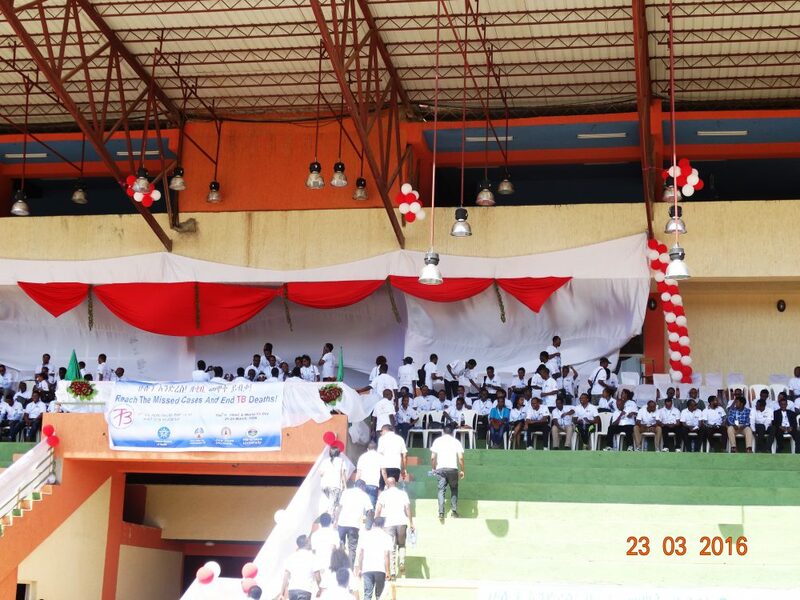 The three days scientific conference which preceded the colorful TB day celebration was held in Dire Dawa University. After we all marched towards Dire Dawa university accompanied by the melodious sound of Dire Dawa scouts march band, we were welcomed by sensational tunes of Dire Millennium Band and the conference was officially commenced by series of key note addresses, welcoming and opening remarks by FDRE State Minister of Health H.E. Dr. Kebede Worku, Head of Dire Dawa Health Bureau Dr. Muluken Argaw and Mayor of Dire Dawa city H.E Mr. Ibrahim Usman. Representatives from WHO, USAID, CDC, and other partner organizations also officiated the three days conference with bold expression of their renewed commitment to support the country’s effort in advancing health research. As the scientific conference unfolds in the subsequent sessions, various presentations and lectures have been presented on topics including clinical trials, epidemiological research, country strategy priorities and global updates on M/X-DR TB Management by notable researchers and experts from the WHO, AHRI, FMOH and KNCV. The presentations were followed by panel discussions on country adaptation of the End TB Strategy three pillars and on transforming TB Response through Research and Innovations. The panel discussions, which ignited a heated debate and discussion, shed light on the importance of research and innovations on the fight against TB in line with the vision of the End-TB strategy and the need for developing countries like Ethiopia to play a vital role in research and innovations. The subsequent two days of the conference also reaffirmed the theme of the scientific conference “Transforming TB Response through Research and Innovation”. 41 oral presentations and research findings and abstracts have been presented followed by panel discussions moderated by senior experts. Participants also had a chance to see and discuss on over 20 poster presentations exhibited during health breaks. Researchers from various universities and individuals competed for the best abstract award and after a rigorous assessment by the abstract review committee; three outstanding abstracts have been awarded. The scientific conference was concluded with recognition and award ceremony only to mark the beginning of yet another colorful celebration of the World TB day in Haromaya University. Participants of the scientific conference once again travelled to Haromaya University in the morning of 24 March 2016 to celebrate the World TB Day. The newly built gigantic campus stadium hoisted colorful banners with this year’s TB Day theme: “Reach the Missed Cases and End TB Death”. The event commenced with a welcoming remark from the University President Professor Chemeda Finensa. The subsequent sessions were filled with entertaining sport activities which include soccer game between Harari and Diredawa cities administration Staff, Camel Race and athletic competition between FMOH and the Regional Health Bureau staff members. 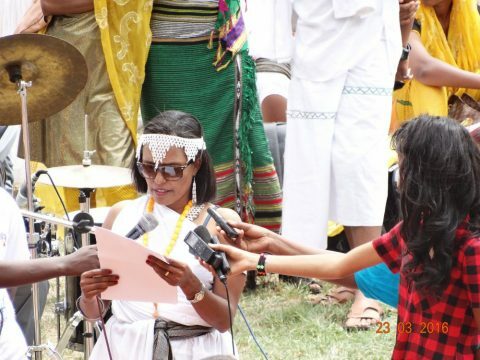 These activities, which were later broadcasted in print and broadcasting media were aimed at raising awareness about TB infection and prevention among the communities in Ethiopia. A festive feel filled the stadium as fans and supporters cheer for their teams. Winners received their awards from Ethiopia’s TB Good Will Ambassador: veteran athlete and Olympic gold medalist Derartu Tulu. Derartu called for increased attention for TB from all stakeholders.